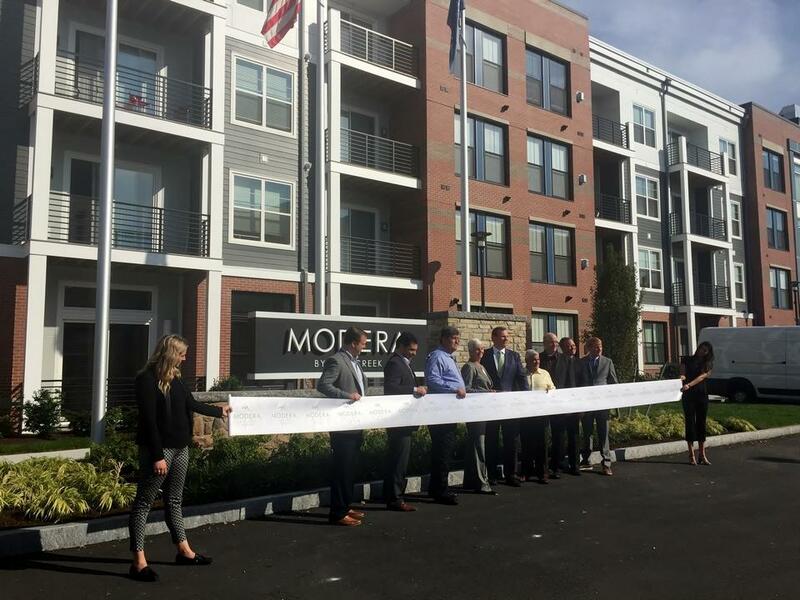 Elected officials and city staff attended the grand opening of Modera Medford apartments by Mill Creek, located on Cabot Road along the Malden River, on Sept. 26. The apartment complex consists of 297 units, 30 of which are affordable. Four of the units are studio apartments, approximately 140 are one-bedroom apartments, approximately 130 are two-bedroom apartments and 16 are three-bedroom apartments. Lars Unhjem, the vice president of development at Mill Creek, addressed the crowd to thank his team at Mill Creek and the city for its partnership with the company. He noted the amenities offered at Mill Creek, including a fitness center, an outdoor pool, a shuttle to the Wellington T station, a rooftop deck, a dog spa and access to the restored riverfront park along the Malden River. Unhjem told the Transcript that the apartment complex’s focus on one, two and three-bedroom apartments is based on Mill Creek’s assessment of the target market for this type of complex in the area. “It’s much more people who are younger, with smaller household formations, not as many growing families per say, but people who are downsizing and want to be closer into the city, or people who are looking for a relief from the pricing pressure in Boston or already work or live in this area,” he said. Approximately 50 percent of Modera Medford’s units are already occupied. Alicia Hunt, director of Energy and Environment for the city, told the Transcript that the entire area that Mill Creek now occupies was formerly a heavily contaminated brownfield. Much of the redevelopment of the area was spearheaded by John Preotle of Preotle, Lane and Associates, Hunt said, who owns the River’s Edge Apartments adjacent to Modera and began to clean it up about 15 or 20 years ago. “He was the first developer to sort of really come and help clean up the area, and he can talk about the piles of tires they pulled out. They pulled a sunken barge out of the river,” Hunt said. In her remarks at the ceremony, Mayor Stephanie M. Burke referenced the transformation of the land parcel that the apartment complex now occupies.